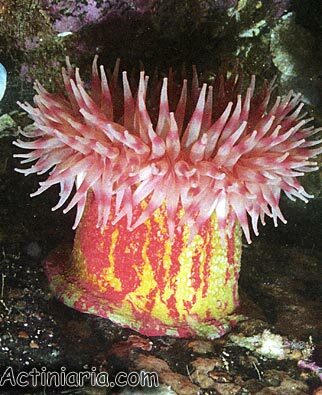 This common North Pacific species often is called Painted anemone or Christmas anemone and erroneously identified as Urticina crassicornis or Tealia crassicornis. Actually, true Urticina crassicornis is a very different species having absolutely smooth body, while in Painted anemone (Urticina grebelnyi) the whole column (body) is covered by numerous nonadhesive vesicles. 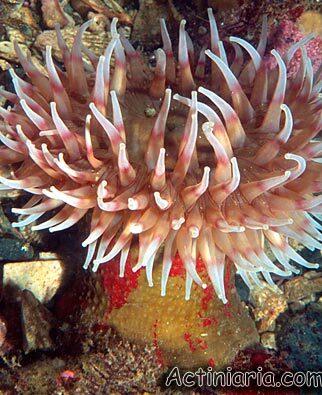 According to recent revision of Urticina, valid name of Painted anemone is Urticina grebelnyi. The typical specimens of Urticina grebelnyi are large, about 20 cm high, with the cylindrical column about 15 cm diameter, and crown of the tentacles up to 25 cm diameter or more. Occasionally much larger specimens occur, up to 50 cm high. The pedal disk is always wider than the column. The colour pattern is almost constant and shows only a little variation. The column is covered by large irregular patches of green or yellow and red, the size of these patches varying; in some specimens the prevailing colour is red, in others green. The whole column is covered by numerous nonadhesive vesicles. 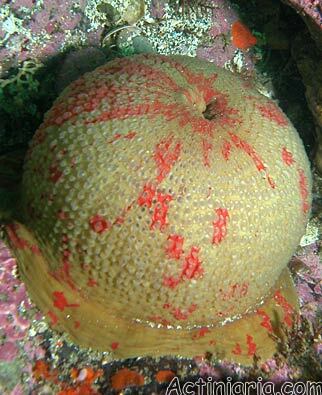 In fully expanded specimens vesicles do not protrude over the surface of the column, and since they often are not marked by their colour, they may be inconspicuous. When the specimen contracts verrucae become large, inflated and thin-walled (see photos below). The oral disk is pale yellow-green, pale lilac or brownish. 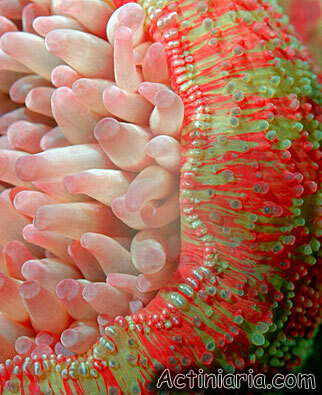 Short thin red radial bands outline the tentacle bases; otherwise the colour of the oral disk is plain. Tentacles, up to 200 in large specimens, are shorter than the radius of the oral disk (up to 4-5 cm long), up to 1 cm diameter near the base. The tentacles are the same colour as the disk or paler, and are always encircled by a wide lilac, reddish or brownish band in the middle. Tentacle tips are often the same colour. The specimens are always attached to large boulders or rock, and are never buried in sand. The column is always clear from gravel particles or other foreign matter. The species is characterized by its large size and numerous nonadhesive ampullaceous verrucae spread over the whole column. They may become large and inflated when the specimen contracts. The species is most closely related to the northern Urticina eques, which has smoother body and differs in its inner structure. 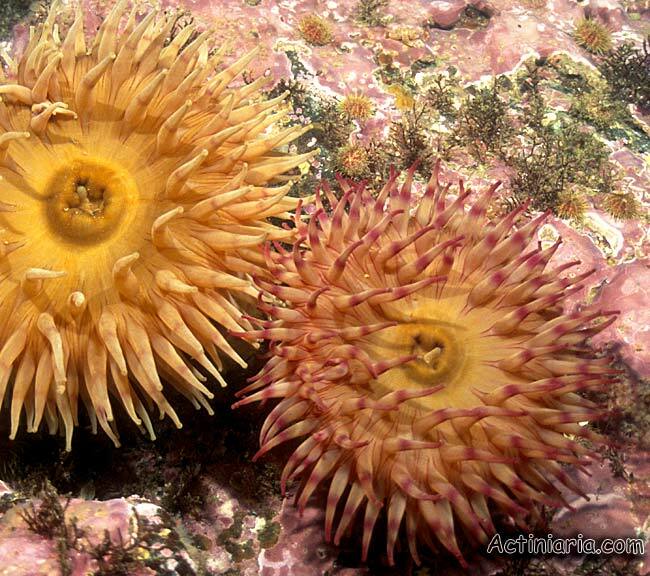 The present species is not related to Uricina felina and Urticina crassicornis. 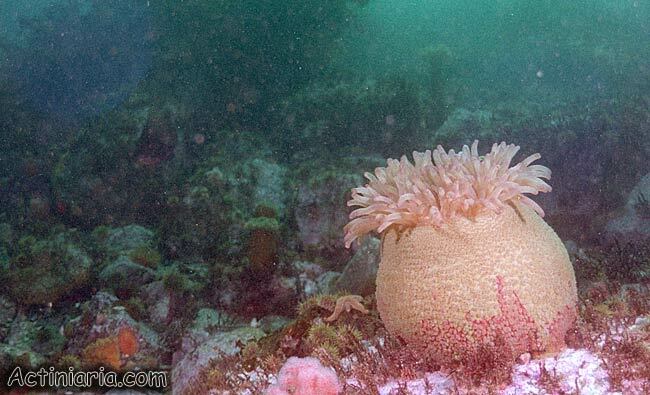 Uricina felina has strongly adhesive verrucae (very different from the nonadhesive verrucae of Painted Anemone Urticina grebelnyi) and Urticina crassicornis always has a smooth column.